This isn't a real ad, but I pulled all of the attribute words (world-class programming skills, outstanding, excellent, bright, talented) from a Google job listing. The last line about being a loser is all mine ; ) But it's not just Google that's looking for the best and brightest, of course. I have to admit that this sounds exactly like the kind of developers I'd love to spend time working with. They'd be good for me. They'd raise my skills, and I'd probably get a little smarter just being near programmers who are world-class, exceptional, outstanding, excellent, bright, and talented. And there are plenty of people out there who meet that criteria. The trouble is, those who meet that criteria often tend to be... similar. There's a reasonably good chance that they got to be world-class developers by having a somewhat similar background, from the C.S. degree at a top-notch school to work experience at a recognized company. And in the US, that means they also tend to be under 45, white, and male. According to James Surowiecki's The Wisdom of Crowds, that lack of diversity can hurt both innovation and decision-making. Sometimes with terrible consequences. But he contends that it's not necessarily the lack of demographic diversity that's at the heart of the problems... it's cognitive diversity you need. If those doing the hiring are going after only world-class, exceptionally bright people with similar skills, the differences between the Chosen Ones may not be that useful. He claims the company needs to hire not just only the smartest people! "What was missing most from the MMT, of course, was diversity, by which I mean not sociological diversity but rather cognitive diversity. James Oberg, a former Mission Control operator and now NBC News correspondent, has made the counterintuitive point that the NASA teams that presided over the Apollo missions were actually more diverse than the MMT. This seems hard to believe, since every engineer at Mission Control in the late 60's had the same crew cut and wore the same short-sleeved white shirt. But as Oberg points out, most of those men had worked outside of NASA in many differrent industries before coming to the agency. NASA employees today are far more likely to have come to the agency directly out of graduate school, which means they are also far less likely to have divergent opinions. That matters because, in small groups, diversity of opinion is the single best guarantee that the group will reap benefits from face-to-face discussion." I hope every hiring manager reads both of these books and at least considers some of their main points. And if you're looking for a job, the studies/research/stats in these books might give you a little more ammunition when you're up against the "we only want to hire people just like the world-class people we already have" attitude. It might help you learn to frame/position what you do bring, in ways that might not be immediately obvious. » Where are 2005's best posts? from Mister Snitch! I'm definately going to have to go and look up James Surowiecki's book. Your post hits home for me because my husband is both a "world-class" programmer (although I might be biased about the world-class bit!) and looking for another job right now! One thing that I thought about, and I'm sure this is not a novel thought, but if we want to start employing people of different cognative abilities, we need to encourgae different types of cognative development in schools ie realizing and embrasing the fact that not all children learn the same/think the same way. Of course, this is not new, as I said, but it crossed my mind as I read your post. "C++ programmer, fluent in English, Swahili and Braille." !? I wonder if they ever found anyone or if it was just a formality for an internal guy. The job market lately has been showing me that the hiring managers don't want people who can do anything other then the job description. The less "other skills" they see the better. The engineering job market has never been all that kind to me so I have spend some effort on "Other skills" they seem to have been hurting rather than helping my job search process. It is an interesting problem, managers choose people like themselves because they probably think they get some deeper understanding of those people if they came from a similar background. That gives them some common ground to start water-cooler conversations but that doesn't last all that long. And if you pick employees because of the universities or companies they worked at before you end up with those cultures within yours whether you like it or not. More often or not you'll end up a a lot of people with the same blindspots. Trying to explain this in an interview without having the hiring manager end up thinking you are telling him his is wrong will be a challenge. Telling someone he is wrong is a great way to get fired. I think it is a great idea though. I have always found better solutions from outside whatever industry I am currently working in then within it. When I am in that position I will try to remember this. I also wonder if the reason small companies do so well is that many of their people are doing more then one kind of job and so are forced to think about different boxes and the ideas come from the intersection between boxes. As the company gets big, people have to specialize which is great for efficiency, but maybe not so good for innovation. That's basically exactly what I told Google in my job application. I never heard back. "Here's an undeniable fact: nobody has an IQ. Tests that measure IQ aren't thermometers or dipsticks, despite the quantitative implications of "quotient". They're merely bunches of questions. You might answer them well on one day and poorly on another, without being smarter or dumber at either point in time." "...pretty much everybody is smart. What's more, they're all smart in their own ways." What companies like Google and Microsoft and others who rely on tests and IQ and so on fail to realize is that, as you point out Kathy, they are only going to get one kind of smart person this way. And they're going to miss out on all those smart people who don't test well, or who aren't smart technically but may be incredibly smart when it comes to sniffing out new ideas, or knowing how to communicate with the customer or evangelizing a product. In Google's world, I'm *definitely* a loser. Maybe we should start a "high-tech company losers club" :-) I'll be happy to be a founding member. 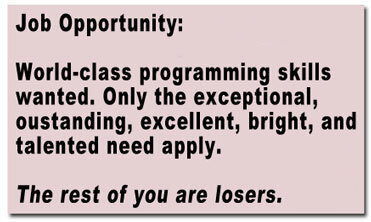 "The last line about being a loser is all mine"
Actually, Bill Gates said something very similar to that a couple of weeks ago: "Anybody who's got good computer science training, they are not out there unemployed. We're just not seeing an available labor pool." Which I then griped about over at http://www.backupbrain.com/2005_04_24_archive.html#a004508 . I'm white and (just barely) under 45, but I'm female, and I haven't been able to find anyone who'd hire me since 1998. It's a good thing the tech book biz is picking up again! You think that most world-class programmers are under 45 and white? I've worked with only a handful of great programmers who fit that description. I've worked with many, many brilliant programmers though. Good luck hiring some great programmers, then. You've cut your applicant market to a fraction of its real size, and if the white-and-young programmers get to know your attitude I have the feeling that you'll find it hard to keep them, too. Matt: Wow, it sure sounds like you took me seriously on that ad, and I apologize for not being clear enough. I was trying to express that what the typical big tech company considers to be "world-class" , "exceptional", and "bright" is usually too narrowly defined, and by *their* criteria, yes--as I said, the ones they hire today that appear to meet that criteria tend to be under 45, white, and male. What the rest of my post tried to explain was how WRONG that is on every level. Excellent blog Kathy. I am going to look into those books. I think something else that is interesting about this is how other people view those they work with. I know that there are a lot of people I work with that are much smarter than I am. But I also know that I have the leg up on a few others. And this isn't always just in terms of knowing how to program. I work well with everyone and I get the opportunity to not only teach but to learn and sometimes the teaching and learning happens with the same person. In a room full of MIT high honor gradutes I wonder how much learning and teaching is really going on. I have a feeling you get 10 of those people in the same roon they are just trying to prove to one another that they are each the smartest in the room. How does that lead to productivity? Well Gregg, I can tell you I've learned a lot in those rooms. Sure there are primadonnas where everyone is just trying to compare the size of their... IQs, but by and large really smart people are both confident and know they need to constantly learn from others. More generally, this is a question of terminology. I do only want top candidates. Medicore candidates lead to mediocre jobs, products, work environment, etc. "Top" however does not only mean high IQ. Sure, i need some smart tech guys. I need guys who are hungry and won't say no, and will beat their heads aginst the wall to solve the problems that can't be solved. I need people who have different industry models. (I'm a huge fan of learn outside your discpline and that was actually seen as a big plus when I was hired at my current job.) I need creative guys. I need guys who are intuitive. I need guys who learn not by books but by getting their hands dirty. But no matter what type someone is, I do want them to be at the top of the distribution under that metric. I owe you an apology -- I did misread your intent. Please consider my comments redirected to the third parties in question. I did catch your meaning the second time round and I think that we're exactly on the same page here. I couldn't agree more with what you've said. Hey Matt, NO apology needed! While sometimes I intentionally write things a little ambiguously, this blog entry wasn't very clear because I was just being stupid. Not my cleanest post, and I'm sure you weren't the only one to wonder if I'd lost my mind. Thanks for reminding me that a second edit is usually a good idea ; ), and thanks for coming back. It seems some elements of your argument are confounded. First, diversity is as desirable within groups as it is desirable between groups. Back up farther from your own perspective to notice that hiring is an act companies engage to find non-CS, non-programming people, too. Ideas can be hatched outside of programming groups, and programmers can hatch good ideas that live outside computers and code. There is no ownership of ingenuity or genius. It is more appropriately cultivated across humanity than it is a signature of one school or state. Second, you mistake the basis of successful diversity as being caused by introducing people who are less-smart. The basis is more appropriately related to the fact that diverse groups would be a more representative sample of humanity. Think of the law of large numbers, the more diverse representative sample would have a distribution of intelligence that resembles the distribution of the overall population, not just that for a small subset. It's not that less-smart people make things better. It's that small, homogeneous groups tend to share similar biases. Shake up the group, and you can knock down biases. Third, you make the common mistake of attributing some objective relevance to IQ. IQ metrics are subjective and artificial. Successful performance is a more natural, flexible, accurate measure of 'intelligence', since it reflects a more realistic range of challenges to the intellect - group or individual intellect. How would it work if the group took the IQ test? How would it work if the individual did the work without his colleagues? Please take a look at "Judgment under uncertainty", Eds. Kahneman, Slovic, and Tversky. By the way, is it possible to be rated 'world class' a priori? Thanks for the comments. I wasn't very clear in my post, obviously, and I apologize for that. First, I'm using the term "smart" in the pseudo tongue-in-cheek way that Suroweicki uses it, which is indeed in the traditional, IQ-based (misguided) way. I'm using it that way precisely because it IS the perspective that--like it or not (and we do not)--many of these big tech companies are thinking about it. So am I advocating "hire some less-smart people to throw in to the mix with your really smart people"? As long as these companies are committed to using--and administering--traditional IQ tests, our only short-term hope is to say, "OK, sure, this guy over here isn't as smart... but that's exactly why you need him on your team... and here's the research that shows smart+smart may be less effective than smart+not-so-smart." The fact that WE recognize that the intuitively creative programmer with the lower IQ is not less-smart but simply, well, "differently smarted", is not the issue. We are not the ones that need convincing. It's a much bigger, harder issue, and a longer-term one, to convince these folks that smart does NOT always equal high IQ. I say we let Suroweicki tell companies that considering the less-smart people makes sense, and THEN we can work on the larger problem of convincing them that they've got a mistaken, ineffective definition of "smart". So maybe I should have done a search and replace on my original blog and change each instance of "smart" to "smart in the classical, high-IQ way", but that would have made it unwieldy and not so fun. Unfortunately, I sacrificed clarity for punchiness and it didn't work out too well... sorry about that! "Dori... do you *really* want to work for someone else anyway? You've managed pretty well on your own and have reinvented yourself as the Dashboard Diva and that's a fairly cool spot to be in." About a year ago, yeah, I *really* needed a job. I spent a lot of time looking and sending out resumes with no luck. It was a painful experience. Dashboard has, without a doubt, been very very good for me. Macworld and Peachpit are keeping me busy, and busy means $$. Before that came along, though, things were getting scary. And Mark: maybe what you need isn't *guys*. The downfalls of the groupthink dynamic were evident in Washington in the leadup to the war in Iraq. They rejected members of the "reality based community" and had the hubris to think they could, through might and fright, create the reality they wanted. I'm just saying . . . .
Aren't there companies who recruit from campus? I've been involved in hiring people for the past 17 years and there's one lesson in particular I like to keep in mind: Hire to address weaknesses in the team. Everyone has different strenghts, thank goodness. You're right about the shortcomings of having a staff that's all the same. As a manager, I've gotten to know many of my own weaknesses. I try to address those by hiring people that are strong in those areas. This isn't just a good practice for manager/employee balance; it's also a great way to build a well-rounded, effective team, IMHO. I use the term "guys" generically, the same way I often refer to people on my team as "kids" (even the ones older than me). I recently took a job in a media-related industry and one of the things I find refreshing is that the percentage of women is significantly higher in the industry (comtrasted with my previous verticals). I'm a recent grad, from a barely recognized school, with a extremely small CS department. My job hunt was difficult to say the least, but there were flickers of hope with the interviews with companies like Yahoo. I finally landed a position with an extremely small internet marketing firm, and got to hit the ground running. From the point of Google (whom I never heard back from on more than one position I had applied for), I wasn't a good enough developer. From the position of the people who I worked with at the first job (who were 15+ years in the industry with major companies), I was one of the best developers they had ever worked with. I guess the point here is that what school you went to, or what your degree level is, is just a beginning to judge how successful a person will be with your orginization. I guess the idea is that a student from CMU, Berkeley, MIT, Stanford, etc will have had exposure to more sophisticated training than one from a lesser known school. And frankly, it's a valid assumption, but I would *never* base my entire hiring practices on what school somebody went to because it doesn't take into account the drive, and passion for the subject that the person has. I think that experience in the field is a far better measure of your abilities. And the job postings I sorted through for the year I was looking for a job *definitely* supported that. Most jobs didn't really care if you had a degree, but moreso cared if you had 3-5 years of experience. I think the IQ debate basically sorts itself out when you talk about experience, because if you aren't a good programmer, your experience will speak to that, and vise versa. Since my first, short lived position, I have taken another position with an extremely well-known orginization, where it would take me about half a second to say "heck no" to a job offer from Google, or a similar "hot" company. Experience is a pretty poor measure in some cases too, since it really depends *what* that experience was as to how valuable it will be. Also, if you start from the premise that hiring processes are likely to favour people with degrees from leading universities who are white and male (which, by the way, describes me) then 'experience' is only going to perpetuate this; it's a feedback loop. I think different jobs require different skills. If you want to to a lot of difficult, research-y maths-y things (where your staff can follow the latest scientific papers, maybe publish some) then you definitely want staff with PhDs. Most programming jobs don't need anything like that. Most of the time 'quite good' will do. I am not at all convinced that just because people have a PhD (even if it's in related subjects) they will all think the same way. Developing software is a rather abstract task and I don't think it'll make any difference to the way you do it whether you were brought up in the ghetto or in a palace. In either case you'll have come up with your own preferences and way of doing things (in terms of software) and I don't think two people from the ghetto are likely to work more or less differently than one from the ghetto and one from the palace. I don't think recruiting only experienced professionals is wrong. In fact our organization which is small, belives only in very experienced professionals. I worked for Microsoft for about 18 months as a Dev Lead (1st level engineering manager) after the company I worked for got acquired. One of the things that really apalled me about the interviewing process there was exactly the problem you point out: a lack of diversity, not racially but intellectually. The whole interviewing system is set up to find a particular *kind* of smart person: someone who can solve intellectual puzzles quickly under pressure. Unfortunately for Microsoft, this ability to solve puzzles doesn't necessarily equate with programming ability, and it leads to a pervasive kind of group-think where everyone approaches problems in more or less the same way. I've also interviewed at Google, and actually survived the interview process. It was even more algorithm-focused than the ones at Microsoft. Since I never worked there, I can't say how much the same problem effects them, but it may be that Google's 20% time for side projects helps counter-act the issues. This phenomenon is no more profound than where I work in Asia. I've spent the last 7 years working alongside some of the most qualified and sometimes extremely brilliant people you may ever meet (I'm not including myself amongst this group). Hiring and leadership positions are heavily weighted towards those who possess .phd's from a good school and yes many of these people are very similar. Unfortunately, these recruits tend to be good at one thing over all others - succeeding at school and testing. Ask them to think and it's a totally different story. At one time this might have been fine but this part of the world is changing and there is less emphasis on 'blind' narrow skills. People are being asked to think and create original ideas. Artists with little training but recognised abilities and needed skills are taking more point positions within research organisations. It's happening very slowly though. Re: Microsoft hires only puzzle-solvers in engineering. That is very funny - it's exactly the impression that I get from their software: It was written by brilliant hackers who can make the worst design work. They are geniuses who can make even a completely broken architecture pass QA.